We know the post-booking process isn't fun. It's long, complicated and costly. Why not let automation tools take care of everything, such as queue management, schedule changes, and missed ticket tracking? Free yourself and let robotic applications manage all these manual, time-consuming activities. It all happens behind the scenes, saving you time and money from debit memos and payouts. 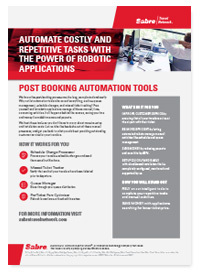 BE MORE EFFICIENT by letting automated robots manage manual activities like schedule and queue management. SETUP QUICKLY AND EASILY with cloud-based installation that is completely configured, monitored and supported by us. RELY on our intelligent tools to complete your repetitive tasks and manual activities. SAVE MONEY with applications searching for lower ticket prices. We host these tools so you don't have to worry about massive setup and installation costs. Let us take the headache out of these manual processes and get you back to what you do best: providing outstanding customer service for your travelers. Schedule Change Processor prepares schedule changes and send email notifications to the passenger. The tool identifies different levels of schedule changes, including flight number changes and simple depart/arrival time changes. For flight number changes, the process will automate the re-validation or the even exchange of the eticket record from a schedule change to reflect the new flight schedule. Following the successful re-validation or re-issue, the process will automate the OSI, SSR or email message advice to the relevant airline to inform of the re-issue/re-validation, according to pre-defined and configurable requirements for each individual airline. It then evaluates configurable Time Tolerance settings for both earlier than and later than original flight departure time, validates Minimum Connection Time on new schedule, prior to acceptance, and finally documents the travel record with process result remarks. The tool sends email notification to the passenger, using configurable email subject lines and email header text lines via TripCase(R) or a 3rd party email solution. Queue Manager manages the repetitive manual process of queue distribution. According to configurable and hierarchical business rules, Queue Manager automaticaly analyzes airline SSR, OSI messages and segment status codes in PNRs found on airline notification queues, and re-distributes or removes from queue, as required. Re-distribution to alternative queues includes capability to configure agents’ personal queues, mapped to each agent’s sign-in or EPR (Employee Profile Record). Queue Manager is configurable to re-use the same PIC (Prefatory Instruction Code) as originally used by the airline’s notification, an alternative system PIC, or even custom PIC. Low Fare Optimizer automatically searches and re-books a lower fare on itineraries before ticketing. When your traveler purchases a trip via online booking tool and pays with credit card, Low Fare Optimizer continues to check for lower inventory fare/class availability on the exact same itinerary up to a pre-configured cut-off time. If a lower fare is found prior to the cut-off time; the new fare is stored in the travel record and then sent to ticketing/fulfillment queue.